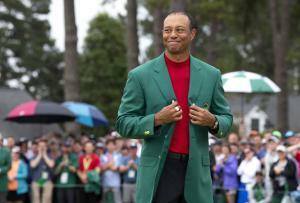 April 14 (UPI) — Tiger Woods, who battled back from multiple surgeries and a personal scandal, completed a remarkable comeback to capture his fifth win in the Masters tournament Sunday at Augusta National Golf Club in Augusta, Ga.
NFL players from around the league watched Woods’ historic turnaround and showed the star golfer support on social media. Kansas City Chiefs quarterback Patrick Mahomes, much like the patrons at the event, was in disbelief about Woods’ win. New England Patriots star quarterback Tom Brady, who won his fifth Super Bowl championship last season, joked about reaching Woods’ career titles mark. Woods’ win at Augusta National was his 15th career major title and first since 2008. After Sunday’s victory, Woods trails only the legendary Jack Nicklaus, who has 18 career major titles. Baltimore Ravens backup quarterback Robert Griffin III, who shares a similar story with career-threatening injuries, expressed his happiness about Woods’ triumph and said to “never doubt a champion.” Griffin has notably battled injuries throughout his career, including a major knee injury with the Washington Redskins in a wild-card game in 2013. Philadelphia Eagles tight end Zach Ertz, who played in three seasons at Stanford, congratulated Woods on his accomplishment. Woods spent two years at Stanford before turning pro. Green Bay Packers tight end Jimmy Graham is using the Masters as motivation for the upcoming season. Graham, a five-time Pro Bowl selection and All-Pro choice, has never won a Super Bowl title in his career. Pittsburgh Steelers defensive lineman Cameron Heyward went as far as saying that video game developer and publisher Electronic Arts (EA) is likely “scrambling” to bring back the “Tiger Woods PGA Tour” video game series. Woods’ name was removed from the game after the 2014 edition.